By coating ingredients in Knorr Batter Mix Flour before dipping them into wet batter will prevent the batter from sliding off after frying. 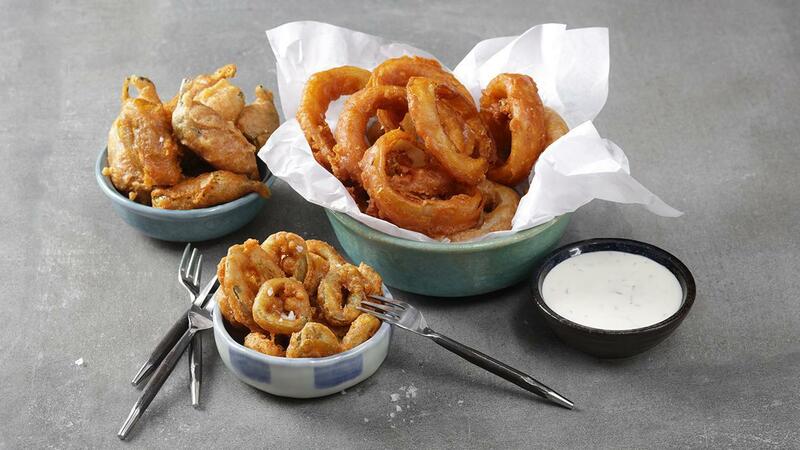 Slice the onion rings down the side to form large rings, coat them with Knorr Batter Mix flour. Slice the jalapeño chillies in rings or lengthwise, coat them with Knorr Batter Mix flour. Make batter by mixing Knorr Batter Mix, cumin, turmeric and water. Set aside in the chiller for 15min before frying. Finely chop the mint & mix with Best Foods Real Mayonnaise and yoghurt.